There are hidden gems where we can explore interesting and unusual cuisines in neighborhoods most people might not know about. With Sue Ralston’s visit to Ghazni Afghan Kabobs in Hayward, we start to seek food discoveries in unexpected places. After moving to Castro Valley a few months ago, my husband and I were on the lookout for new restaurants to try. Fast-food joints were everywhere, but we were craving some great ethnic fare. After all, the ready availability of a huge variety of restaurants was one of the benefits of returning to the Bay Area after a 15-year absence. 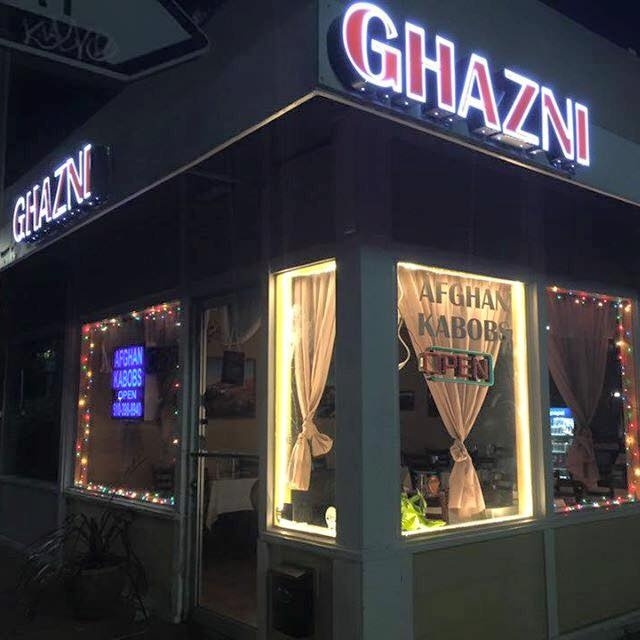 One day while driving up A Street in nearby Hayward, we spied a little corner restaurant with a sign that said Ghazni Afghan Kabobs. We were intrigued and decided to stop in. The unassuming storefront gave way to a small (26-seat) restaurant with mustard-yellow walls, tables draped in white cloths, and the enticing smell of grilled kabobs beckoning us. 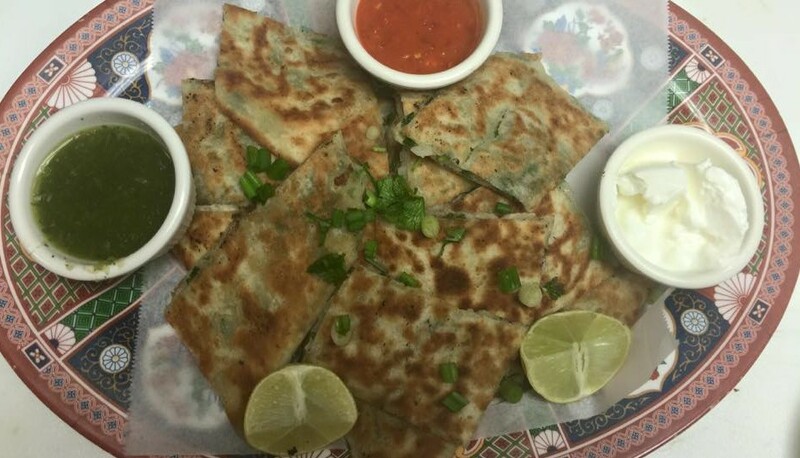 The first time we went in, we ordered two of the three available appetizers: Bolani (seasoned flatbread cooked with leeks or potatoes in the center) and Borani Banjan. Both came with tantalizing piquant green sauce, spicy red sauce and creamy white sauce – a welcome cooling counterpoint to the spicy sauce. The bolani was exceptional – the kind of appetizer it’s too easy to fill up on before your meal arrives. The flatbread was toasty and the insides were filled with delectable, tender seasoned potatoes or leeks – the perfect Afghan comfort food. The borani, with its sliced eggplant covered with tomato, was also delicious and could be ordered as a larger entrée plate that includes rice. It was one of only two vegetarian options. The third appetizer was Mantu – dumplings filled with seasoned ground beef, topped with meat sauce and yogurt. 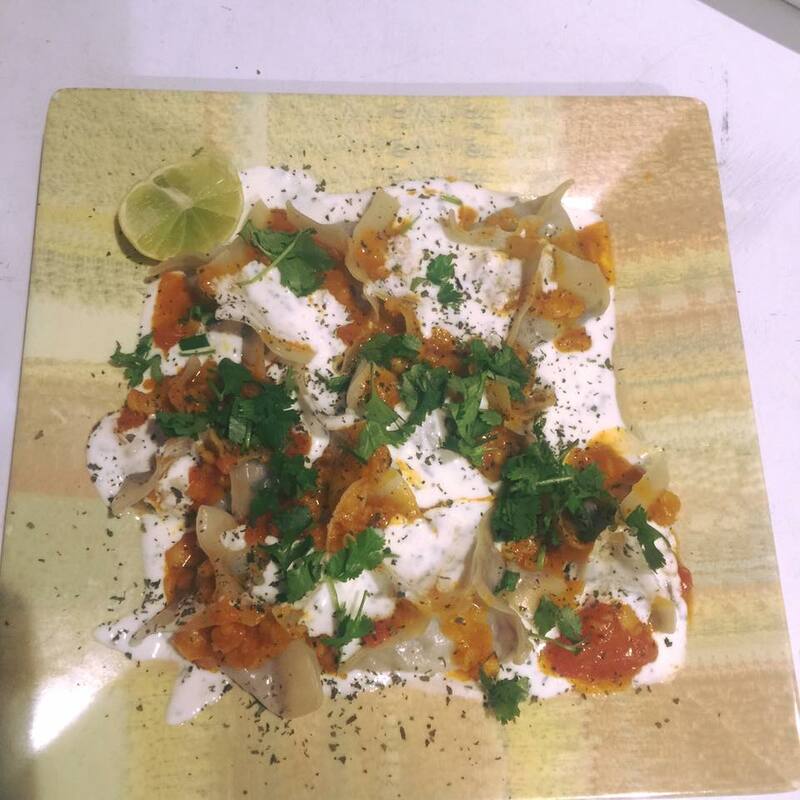 Our gracious server, Najia Ibrahimi, informed me the Mantu is very popular. In our short wait before ordering, we tried to sneak a peek at the plates on tables near us. Everything looked – and smelled – so enticing. We chose the chicken and the lamb and were not disappointed. The meat is always done to perfection, with a perfect grilled crust on the outside, but still absolutely tender inside – never cooked a minute over. Entrée choices were Murgh (Chicken Kabob), Beef (Teka Kabob), Shami (Ground Beef Kabob), Lamb Kabob and Chapli (Ground Beef Patty). Combination plates were also popular. Each entrée plate was served with a generous portion of scented Basmati rice, a green salad with a yogurt dressing, and a small side of Shor Nakhod (a zesty potato and chickpea salad with tangy cilantro vinaigrette dressing). Toasty warm naan is served with every meal. Each time we’ve visited, we’ve vowed to each other and our dining companions that we’ll exercise some restraint – some discipline – and put aside half of our dinner to take home. Sometimes we manage it, sometimes not. Ghazni has been open only a year and a half and the owner, Tawab Wahab, plans to expand the offerings for vegetarians. For now he is adhering to the founding principle of starting small with a limited menu. “We’re not a full Afghan cuisine place,” he said. 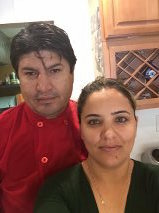 “We limit it to kabobs, and have eggplant and bolani and rice. We just wanted to put the most popular things out there.” All meat is halal. The restaurant doesn’t have a liquor license but, Tawab said, “I know people like wine with their red meat, so they can bring their own wine in.” Remarkably, there’s no corkage fee. In the meantime, soft drinks, tea and Dogh (an Afghan yogurt drink) are available. The food prices are reasonable ($10.95 to $12.95 for entrées) and the portions are substantial. Service is friendly and attentive without being intrusive. 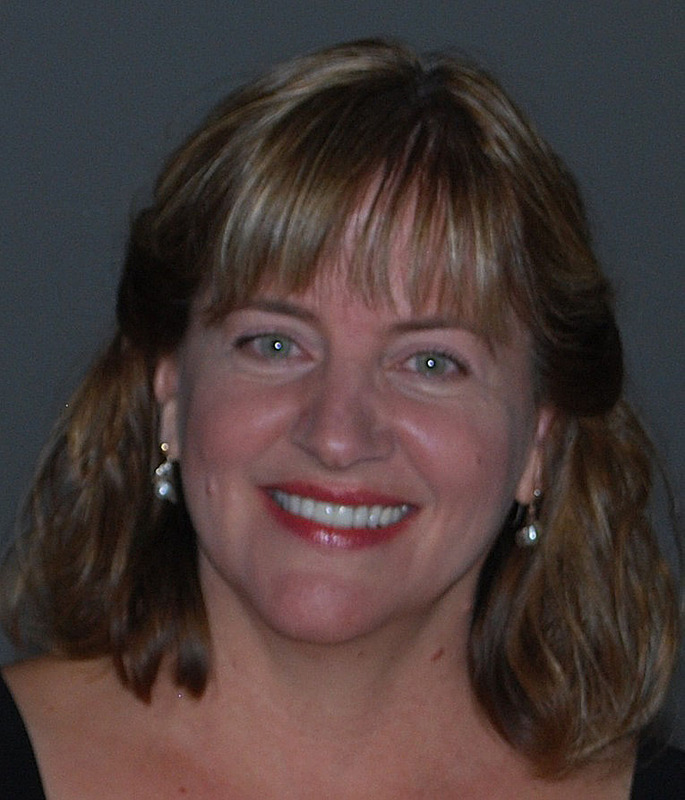 Susan Ralston has been writing for various publications for 15 years and just moved back to the Bay Area after a long absence. She’s looking forward to exploring new eateries, seeing indie films and exploring the beautiful outdoors. 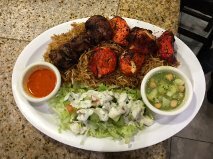 This entry was posted in Eat, Eat: Restaurant Reviews and tagged Afghan cuisine, Eat, Hayward, kabobs, Susan Ralston. Bookmark the permalink.